Set on the edge of the Matjies River Gorge, this 4-star lodge features views of the surrounding valleys and Tsitsikamma Mountains. It offers terraces, an outdoor pool and horse riding. Balconies are standard in the suites of Hog Hollow Country Lodge. Decorated with colourful fabrics and original artefacts, all units include minibar and safety deposit boxes. Walk through indigenous forest to Monkeylandor the Elephant Sanctuary. Hog Hollow is a 10 minutes’ drive from Keurbooms Beach, 20 minutes' drive from Nature's Valley and 18 km from Plettenberg Bay. Located 12 miles from Plettenberg Bay, That Place is a modern self catering guesthouse with balconies overlooking the valleys and the forests. It features an outdoor pool and a fireplace in the lounge. 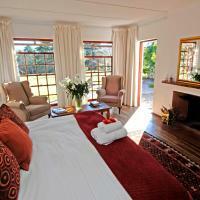 That Place’s rooms are decorated in contemporary African style, and have wooden furniture. It has a washing machine and a sitting area. Guest can prepare their meals in the communal fully equipped kitchen, which features an electric teakettle, kitchenware and a refrigerator. There are also barbecue facilities and an open-plan dining area. Next to the deep swimming pool there is a sauna, were guests can relax. The guesthouse also a library and a porch with panoramic views of surrounding nature. Elephant Sanctuary is 2 miles away, and That Place offers free private parking on site. Offering rooms with private patios with Tsitsikamma Mountain views, Langley House sits on the edge of Garden Route National Park. Plettenberg Bay is 20 km away. Guests of Langley can enjoy a Full English breakfast in the main house. Personalised dinners can be prepared by the chef on request. The bright rooms are simply decorated with light wooden furniture. They include a radio and an electric kettle. The property has an outdoor pool surrounded by a sun deck. You can also take a relaxing stroll in the garden, or explore the on-site dairy farm. The Natures Valley, where the scenic Otter Trail ends, is 10 km from Langley House. Free parking is available on site. Set against the backdrop of the majestic Tsitsikamma Mountains, this historic country guesthouse offers charming accommodation with a garden. Facilities include an outdoor pool, a tennis court, and an art studio. All accommodation at Redford House feature a lounge with a TV, tea and coffee making facilities, and a private bathroom with a hairdryer. Free Wi-Fi is available in the guesthouse’s public areas. Every morning, guests can enjoy a hearty breakfast in the farmhouse kitchen or on the patio. It is possible to have candlelit dinners in the old settler's dining room, and picnics under the ancient oaks overlooking the lake. Redford House offers tours of the old farmhouse, and guided walks along the hiking and birding trails. Guests can fish or canoe on the estate’s lake. Art classes can also be arranged. Plettenberg Bay, Tsitsikama Village, Storm’s River, Keurbooms, Nature’s Valley and Wittedrift are all a 20-minute drive from Redford House. The Elephant Sanctuary is 4 km away. Overlooking the Outeniqua Mountains, Antlers Lodge offers bungalows, cottages and suites a 12 minutes’ drive from Plettenberg Bay's beaches. The property includes an outdoor pool, tennis court and private dam. Each accommodation at Antlers Lodge has a private entrance, a seating area and a wardrobe to store clothes. Each has a private bathroom with a shower. Breakfast is available in the morning and there is also an outdoor BBQ area for guests to use. A Canadian-style log chapel for weddings and conferences is also a feature within the the lodge. Monkeyland is a 5-minute drive. Birds of Eden and the Elephant Sanctuary and the Tsitsikamma Forest are within a 20-minute drive away. Nestled at the base of the Tsitsikamma Mountains in The Crags, guests at Fairwinds can enjoy the peace in a private 3-bedroom cottage. Braai facilities are provided for traditional barbecues on the large wooden deck. The upstairs bedroom features an en suite and there is a further bathroom downstairs. The entire cottage features rustic décor and the lounge contains extensive book shelves. The self-catering property has a fully equipped kitchen with a microwave, stove and refrigerator. There are many restaurants only a 20-minute drive away, in Plettenberg Bay. The property includes a dam covered in water lilies, with a family of ducks, and offers opportunities for walking and fishing. Keurboomstrand beach is only 10 km away. Free private parking is available on site and Bird’s of Eden Bird Sanctuary is 8 km away. 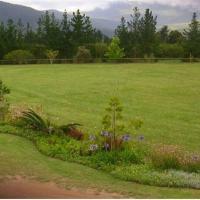 Bramon Wine Estate is a 20-minute drive from Fairwinds Rose Cottage. Trogon House offers treetop accommodations in the Tsitsikamma Forest, a 15-minute drive from the beaches of Plattenberg Bay. It features a lounge with antique furniture and stone fireplace, a pool with a wooden deck and a spa. All of the rooms include a flat-screen satellite TV and floor-to-ceiling windows with views of the surrounding indigenous forest. Some have a private furnished balcony or a spacious lounge. A daily continental or cooked breakfast is served in the Palazzo Dining Suite and 3-course dinners can be arranged upon request. Drinks can be ordered at the bar and enjoyed on the terrace overlooking the pool. The Forest Spa includes a hot tub and sauna. Various natural treatments and massages can be enjoyed while relaxing with an outlook on the forest. On the Garden Route, Trogon House and Forest Spa is a 20-minute drive from Nature’s Valley. Birds of Eden bird sanctuary is within 2 minutes of the property by car. Located in the tranquil surroundings of Whiskey Creek Nature Reserve, Tarn Country House garden features a saltwater pool with sun loungers, BBQ facilities and a terrace. Keurboom Beach is 10km away. The beautifully decorated rooms have tiled floors, wooden décor, and a private patio. Each room has a desk and tea-and-coffee making facilities. Some have mountain or pool views, floor-to-ceiling windows and wooden panel glass doors which lead onto the patio. A buffet breakfast is served daily in the dining room, which features high wooden-beam ceilings, and French-style doors opening onto the surrounding garden. Free Wi-Fi is available in all public areas. Guests can sunbathe poolside or choose from a selection of books in the library. The tour desk can help to arrange a day of sightseeing. Tsitikamma National Park is a 30-minute drive away. 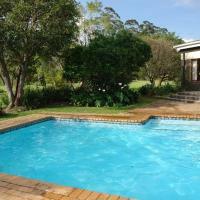 Tarn Country House is 14 km away from local attractions such as Plettenberg Bay, Nature Valley and Monkey Land. Free on-site parking is available at the B&B.